There is, no doubt, there was destruction in Gaza – after all there was a mini-war there a few months ago. But it is nowhere near as widespread as the Guardian would have us believe from its articles and replaying the same pictures of the same few destroyed houses. Actually looking at Gaza tells a rather different story. A few pictures may help you see Gaza in a more balanced way. Go to Google Maps and enter “Kibbutz Nir Am, Israel” and you’ll see a little reservoir west of the kibbutz. Follow the road that skirts the reservoir about 1 km east, and if you look carefully, you’ll see a small road just west of the reservoir leading to a little white patch near a “V” shaped intersection – this is the little hill from which the TV crews reported on Cast Lead, and from which I shot the pictures below on August 8th this year, at about 8:30 am as the morning mist was lifting. It is about 1 km from the fence between Gaza and Israel. 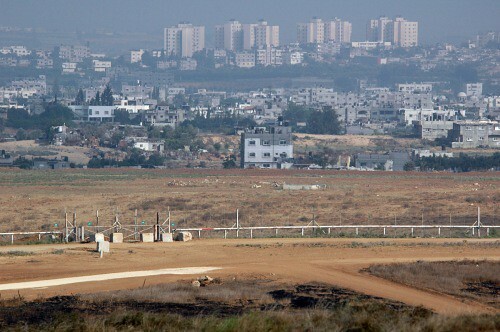 Kibbutz Nir Am, which has been subjected to heavy rocket fire from Gaza, lies about 2 – 3 km north east of this spot. 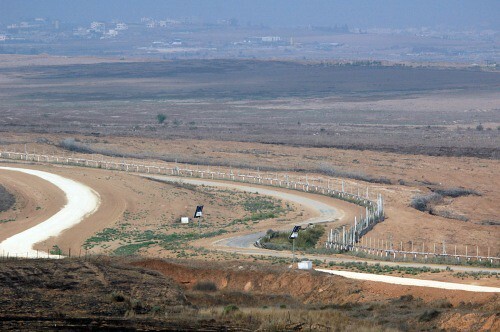 The first picture looks into Gaza from about ½ km on the Israeli side of the fence with Gaza, just west of the Nir Am reservoir. In the foreground, beyond the fence, is Bet Hanoun, one of the villages used frequently by Hamas and its cohorts from which to launch rockets into Israel. Behind that, you see high-rise buildings probably in Jabalya or just west of Sheikh Zaid. Next to the big white house in the foreground there appear to be a couple of destroyed houses, but clearly other buildings and the high rises are in good condition. You can see the security fence, with a gate that allows Israeli troops to enter Gaza when terrorists are detected approaching the fence or for other military purposes. The second view looks south west, and I provide it to emphasize that there is, in fact, open territory in the Gaza Strip, and that the terrorists could, if they chose to do so, fire their rockets and mortars from sites not located in built up areas. Finally, next time you read about the “wall” around Gaza – remember these pictures and how simple a defense mechanism it really is. Superb photos, AKUS ! Seethe Freedman must be eating his heart out ‘coz he never thought of using photos like yours to illustrate his articles. Destruction, what destruction? It all reminds me of the Jenin ‘massacre’ when newspapers kept showing a destroyed building in the centre of Jenin to suggest total desolation there, but never panned away from it to reveal that the surrounding houses were practically intact. The photographs demonstrate that there are areas which were not affected by the fighting. Most of Gaza in fact. The media services were not interested in showing this which is a pity as it leaves the unbiased observer with a wrong impression. CI(F) of course, allowed the commenter No2Genocide to post time after time on the Abe Hayeem thread that Israel carpet bombed Gaza. No2Genocide has 9 comments removed by ‘Moderators and 10 comments left standing. This vile commenter was also the first to comment on the Abe Hayeem thread which may link the person behind the moniker to the author. The rage displayed by the Loony Left relating to the Cast Lead campaign was motivated mostly by the meager number of Israeli casualties. This is an excellent article, AKUS, which really gives the lie to the “complete destruction of Gaza” rubbish peddled above and below the line on CiF. It’s really good also that you showed the acres of open ground from which the Hamas lunatics and their fellow travellers could easily have launched rockets but chose instead to do so from among their own people, no doubt because they preferred them to be sitting ducks and of course “if it bleeds it leads” in the idiotic media. The pictures were shot on 8 August 2009 this year, right? I know that CiF is pathologically allergic to anything coming from this site so how do you suggest that these photos can be used there to counter the stupidity? Is there a web link to them, apart from this one? As people may know, I am banned from CiF but I have been watching the development of this site with great interest. I am glad that Berchmans seems to have fallen off the edge of this little world – no doubt he is causing trouble on a picket line somewhere. He was really beginning to stink up the place and he contributed even less here than he does on CiF. PhyllisStein. I am glad that Berchmans seems to have fallen off the edge of this little world – no doubt he is causing trouble on a picket line somewhere. He was really beginning to stink up the place and he contributed even less here than he does on CiF. Has he actually been banned though??? He still seems to find time to comment on CI(F) so I suppose that he must have been blocked somehow. AKUS, thank you for this. These pictures really do speak thousands of words. May I second PhyllisStein (using her reasoning), that if you can put these up elsewhere on the web then they may get pas the CiF’s daft apology for moderation? I took these pictures at about 8:30 am on August 8th, 2009. The terrorists shooting rockets have plenty of open ground from which to do so, but they know they would be picked of easily if they did. So instead of stopping the rocket fire, they prefer to shoot from alongside schools, mosques, and so on where they can hide their rockets then run out to fire them, before running away. Israel has documented this kind of activity in numerous videos available on the web. I don’t doubt it, AKUS, but could you post some links to them? It is self imposed .. the moderator was not banning me and given his convictions ..was very very lenient. I like to read it tho …I miss it. I have no doubt that the yellow (low damage) areas in the map are really virtually undamaged, but the red areas are still pretty extensive. I wonder if someone tried to do an independent research using satellite imagery to see if the analysis done for the UN was accurate. While the pictures you have posted are important in showing Hamas has plenty of open areas to fire from, for the sake of assessing total damage to Gaza they serve an inadequate sampling. As indeed do the pictures of destruction repeatedly shown in the media. At the same time, FoolMeOnce rightly warns against underplaying the scale of the actual damage. Does anybody care? Not really. Just as the endless stream of reports about the “dire” humanitarian situation in Gaza. The facts to the opposite just don’t register. My post asking No2genocide about her knowledge of carpet bombing has been deleted from CIF. You can expect the same fate. When I think about it, her very moniker, No2genocide, is in breach of CiF rules! As it is quite clear from the context of the threads she participates in, to what imaginary genocide she refers to. Pics are good but carpet bombing would inevitably involve deaths of thousands or hundreds of thousands of civilians of all ages and sexes too. There would be no nuanced spread of male/female casualties according to age where carpet bombing is involved. 3) same is of course true for all the many places (mosques, private homes etc.) that Hamas used to store their explosives — after all, they had tons and tons of this stuff. I don’t want to deny the fact that some buildings were destroyed and damage done in Gaza. There was, after all, a short war/conflict/military action there, and buildings were destroyed and people were killed. No one disputes that. I simply want to provide an alternative view showing that the scale of the damage was considerably lees than many might believe reading CiF (e.g., Pretzel, I noticed your comments disputing the false carpet-bombing claim – good for you!) since so many commenting on CiF have no idea what Gaza is actually like, what the security fence is like. The Guardian builds them up into some kind of alternative universe which does not reflect the reality, or, if you prefer, the full reality. By all means link to these pictures. I think many will be surprised to see the high-rise buildings, the wide open agricultural areas, and so on. I don’t have night pictures, but many, I think would also be surprised to see the bright lights of towns in Gaza lit courtesy of electricity supplied from Israel. AKUS, thanks for the links. I would bet that the buildings destroyed were in the very poor parts of Gaza where they are built close together and where precision strikes were, accordingly, much more difficult although, as we subsequently saw, not impossible. I remember the Beeb’s very own Jeremy Bowen just before the ground offensive in Cast Lead, twittering about in his helmet and flak jacket explaining in great detail how the IDF would not want to be drawn into hand-to-hand fighting in the narrow streets of Gaza because the streets were so narrow that in some places two people could not walk side by side and Hamas knew them like the backs of their hands. Either later in that or in a subsequent bulletin we saw him distinctly rattled and in the open air outside Sderot as kassams rained down, when anyone with a grain of sense would have been under cover. sbaba – thanks for the link to the Avi bell interview on Lozowick’s blog. Very interesting. it looks like the report is systematically being torn apart by those who can spare the time to trudge through it.. Yet another Al Durrah/Jenin massacre media affair. The Sunnis have ceded Iraq and Lebanon to their Shia nemesis, at least for now, but seem to have drawn a line in the sand over Sinai. Just like Israel, Egypt and Arabia regard hamas as Iran’s flunkies. The Red Sea is a strategic waterway that connects the Indian Ocean to the Mediterranean sea, and the Suez canal is the ultimate prize in this game. Through their forward base in Gaza, the Iranians would be in a position to blackmail Europe dependent on energy supplies from the region. The damage inflicted on Gaza by Israel was serious as was the damage caused to Lebanon in 2006. Hezbollah has not fired any rockets into Israel since, thus Israel used the same tactic in Gaza, namely, to batter Gaza with the necessary force to deter future use of rockets by Hamas. So far its worked. The idea is to hold the “elected” leaders of Hezbollah and Hamas responsible for their actions to the people who are the most affected by those actions, namely, civilians in Lebanon, Gaza and, of course, Israel. AKUS, Thank you for this and all the other great articles. I have uploaded your photographs to Flickr but if you don’t like that I can remove them. I’ve never read a statement to this effect but it has always seemed to me that Israel prefers to damage infrastructure, which can be rebuilt, rather than to kill human beings: who can never be brought back to life. I agree. A large military operation in a densely populated area resulted in relatively few civilian casualties. Great post. Very good, Hawk. Ariadne thanks for the links, but as well as the text at the third link I saw stuff that might be personal. You might want to give it a look-over. Thank you, Yohoho. It’s just really a reference collection, apart from the cats, which amuse me. But I’ll check. Ariadne – the flicker photos are fine – a good way to treference them on the other blog, with a link to CW a little buried so the modeators may not automatically delete any references. Tom – I am wondering if we’ve really seen the end – its not well reported, but there are still random rocket firings into israel every week, pretty much, followed by an IDF air strike against the tunnels. Hamas and its friends may (a) be slow learners (b) didn’t actually suffer enough damage for the lesson to sink in (c) be emboldened by the support of efforts like Goldstone’s to try to earn more propaganda points by bringing down further retaliation. PS – for accuracy – the photographs were taken on August 6th, not 8th, not that it matter much – I fell into the trap of the American system of dates vs the system used by the rest of the world gave the wrong day of the month here!! AKUS: be emboldened by the support of efforts like Goldstone’s to try to earn more propaganda points by bringing down further retaliation. Of course, he sat Cast Lead out in comfort in Damascus. They are not slow learners, in fact, they know how to use international pressure extremely well. Yes, Israel should have finished the job in much the same manner as Sri Lanka finished off (for the time) the Tamil Tigers. I agree that Hamas has been emboldened by the Goldstone report, but they have also been emboldened by western support for the Palestinian cause, namely that of the left wing media – led by the Guardian. AKUS and TomWonacott I believe that you are both right but in different ways. In a personal construct psychology sense, Hamas’ behaviour can be viewed as hostility – in this case a sort of hostility to reality. George Kelly (who developed the Psychology of Personal Constructs) defined hostility as the wilful refusal to accept evidence that one’s perceptions of the world are wrong. Instead of reconsidering, the hostile person attempts to force or coerce the world to fit their view, even if this is a forlorn hope and however harmful the cost. Whilst testing theories against reality is a necessary part of life, and persistence in the face of failure is often a necessary part of invention or discovery, in the case of hostility there is the distinction that the evidence is not assessed realistically and a decision made to try again. Instead the evidence is suppressed or denied and deleted from awareness – the unfavourable evidence which might suggest a prior belief is flawed is instead ignored and wilfully avoided. Psychologically, it can be said that reality is being held to ransom, and in this sense hostility is a form of psychological extortion – an attempt to force reality to produce the desired feedback, in order that preconceptions become validated. In this sense, hostility is a response which forms part of discounting of unwanted cognitive dissonance. Thus we get Hamas and the other anti-Israel players refusing to admit to themselves (in spite of their experiences of defeat after defeat at Israel’s hands) that it might be better for them to try something different which will cost them less. Instead after having successfully manipulated their own people into never ending victimhood, they manipulate the world media’s reality by playing that victim card and underlining the “victim” status associated with it (for which they are principally responsible for the reasons mentioned above) so that others will also try to manipulate Israel into caving in to them, rather than forcing Hamas themselves to confront the mess they have made and act to repair it. Surely this is the absolute opposite of carpet bombing, collective punishment,or genocide. Surely this is the epitome of specific,targeted attack,almost entirely in two areas,ie, al-Zeitoun and al-Tuffah. Note the vast untouched areas,including rural ones, to which civilians could presumably have fled ,contrary to the no place to flee to stories. The next map down shows the vast majority of Gaza to be entirely untouched. Multiple attack sites are in three places,two in Gaza City,and one on the tunnels. Note also,this is a U.N. map,dated 19-01-09. Is this the proverbial non-smoking gun? And victimhood began in 1948……..Doesn’t that coincide with the Nakba? TomWonacott, personal construct psychology works mainly with trying to understand how people construe their world. “Nakba” has passive connotations – and often “victims” feel and are passive and powerless to influence what is happening to them. It suits the Arab nations and Palestinian leadership to reinforce that passive-aggressive victim status so as to manipulate the wider world against Israel. So we get the wail that the creation of Israel was a tragedy, and indeed it was perceived as such, but no inclination on the part of Arabs/Palestinians to acknowledge their own part in the creation and perpetuation of that tragedy. We can all play “if only…” but if the Arab states had pursued a lasting peace with the nascent Jewish state instead of war, there would not have been a Nakba and instead there would have been a thriving Palestinian state alongside Israel. Anonymous comment at 4:22 PM …………. The ‘Dry Bones’ cartoon had made reference to the fact that the whole Muslim world – 1 billion people – is being taught to hate Israel/Jews, but the world still sees the Israel-Arab conflict mainly as a ‘local dispute’ ! The UN General Assembly approved on Thursday an Arab-backed resolution endorsing the Goldstone Report, paving the way for the matter to be sent to the Security Council. Does any one know what happened to the 800,000+/- Jews who lived in the arab world for a couple of thousand years? One has to ask what is going on. Perhaps the existence of an independent state with regular peaceful changes of government, an attitude of equality, scares the oligarchies?